Up on the fourth floor of DeMoss lies a world that can only be described as real-life Pinterest. Walking into an Interior Design Association meeting feels like being thrown into an alternate universe with tons of beautiful fresh-faced girls with braids in their hair, working on what appears to be crafts and mood boards. There are flowers and sugar cookies everywhere. Everyone is chatting and smiling in the most welcoming manner. The association makes their meetings feel more like a party. Interior design is more than HGTV and Chip and Joanna Gaines or deciding what neutral shades of gray go best in an off-white kitchen. According to Alyssa Cirillo, a senior Interior Design major, she was drawn to the creative major because of the skills needed. Sophomore Emily Engle found interest in interior design at an early age. Members of Liberty’s Interior Design Association, many who are majoring in interior design, said they need to have more skills than simply having naturally good style or being creative. While “interior architecture” may be a new term for those not familiar with interior design, Cirillo was not shy in explaining how knowledgeable an interior designer must be. She explains how interior designers tend to have a lot more skills and information and are problem solvers but in an artistic way. While the program might not be that well known and is still a smaller department, the girls are excited for some of the changes coming to this major very soon. “The program has been revamped, and our department is currently working on getting our CIDA (Council of Interior Design Accreditation) which will take our program to a whole new level, which is very exciting,” Cirillo said. Cirillo described this major as creative and fun but also lots of hands-on projects that go outside the classroom. Emily Wilson, a senior interior design and business major at Liberty, is also the president of the Interior Design Association. Interior Design can offer a variety of careers especially for someone like Wilson who has paired her Interior Design major with a degree in business. 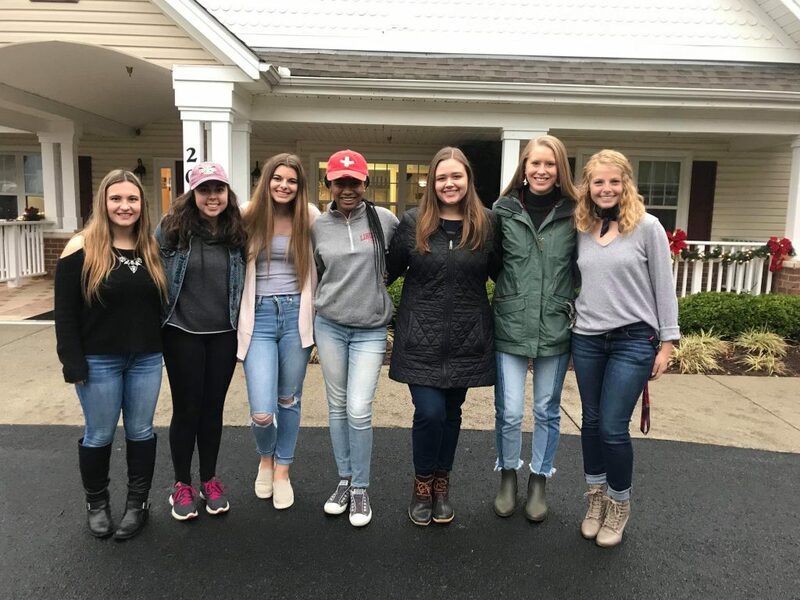 HANDS-ON — The club joins to serve at Runk and Pratt Senior Living Communities. Wilson described just how necessary it is to have good communication skills is for a designer. Wilson is looking forward to a semester packed with creativity and learning for the organization. The Pinterest Party will take place on Feb. 7 at 5:30 p.m. in DeMoss 4162, and is open to anyone interested in interior design. Tell Alyssa her cousin said Hello. I would love to attend your Pinterest Party if possible.